The etymology of the word, peridot, the birthstone of August, can be traced only back to the French word, peritot. We do not know the original source beyond that. Its first recorded as mined from St. John's Island, located off the coast of Egypt. Peridot on St. John's Island was so radiant that it could be found at night. Any trespasser caught steeling from these early mines was killed. 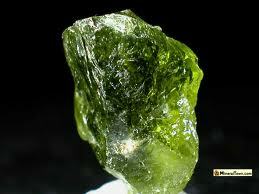 Peridot was prized by Egyptian kings and first referenced in papyri text that goes back to 1500BC. (Kuntz.170) Even today, St. John's Island is one of the main sources of Peridot.